Location: we know what makes sense from a GFNY perspective. They allow bikes in your hotel room, which is rare in NYC. You are around other participants for an impromptu training ride or sharing war stories after the event. Guaranteed availability of a 4am breakfast on raceday to fuel you for the big day. We've done the research; all you need to do is book. The hotels offer discounted rates to you and not a commission to us. $289/room/night for up to 2 people, extra $30 for 3rd person and extra $30 for 4th person. Daily rate does not include tax – NY – 14.75% + Occupancy fee of $3.50/room/night. Rooms are subject to availability. Offer expires April 30 @5pm ET. Free in-room WiFi, a $14.95 value, per room, per 24 hours. Complimentary fitness center access ($10/day value per room). Breakfast is not included. A 24hr deli, Café 53 (212-974-6075) is located on the ground floor of the hotel, on 53rd St, between 6th & 7th Aves. We recommend that you put in your breakfast order on Saturday and the time that you will pick it up on race morning. This 4-star mega hotel is the closest GFNY Official Hotel to Central Park for your morning cycling and centrally located in midtown Manhattan. Steps to Times Square, Rockefeller Center, Broadway and shopping. Renovated in 2017 for your maximum comfort and pleasant stay. Spacious rooms, larger than average NYC hotels, make it more comfortable to keep your bike in your sleeping room. Book HERE or call +1-888-627-7067 and mention “Gran Fondo New York” when making the reservation. $249/room/night for One Queen room, up to 2 people. $279/room/night for Two Double room, up to 4 people. Rates include complimentary wireless Internet access in all guest rooms. Facility fee of $35 inclusive of tax per room per night is waived. Breakfast is not included. Several 24hr delis are located near hotel: Times Deli 158 W 44 St, Cranberry Café 115 W 45 St, Port Gourmet Deli 681 8th Ave, Olive Tree Deli 1420 Broadway. We recommend that you put in your breakfast order on Saturday and the time that you will pick it up. Simple, functional and comfortable mega hotel located steps from Times Square, Broadway, shopping. Book HERE and use Access Code: GFNY. Email reservations@rownyc.com or call +1-212-869-3600 and mention “GFNY World Championship” when making the reservation. Rooms are subject to availability. Offer expires May 3 @5pm ET. Spacious suites with fully equipped kitchens. Complimentary daily Suite Start hot breakfast and Welcome Home reception featuring a light meal and beverages Monday-Thursday evenings. Daily breakfast included. Grab and Go breakfast at 4am on race day, Sunday, May 19. Great location because you can leave your car parked and take the safe, scenic ride along the Hudson on the Hudson bike path that runs from Fort Lee all the way down to Jersey City. Complimentary shuttle within a 3-mile radius. Multi-million renovation completed in 2018. Book HERE or call +1-201-941-4700 and mention “Gran Fondo New York” when making the reservation. $189/room/night for King Bed and Double Bed rooms. Breakfast not included. Grab and Go breakfast at 4am on race day is available for purchase. Book this hotel if you want to be at the heart of registration/start/finish. The hotel offers daily transportation to NYC for a fee of $20 round-trip per person. GFNY riders appreciate the close proximity to the start, the Police escorted group ride to the start line and Shuttle Van pickup to bring you back to the hotel. Hotel is located on a busy highway, do not plan to ride directly to/from this hotel. Book HERE or call +1-201-461-9000 and mention “Gran Fondo New York” when making the reservation. $159/room/night Single Studio for single and double occupancy, $10 for each additional occupant. $189/room/night One bedroom for single and double occupancy, $10 for each additional occupant. Rooms are subject to availability. Offer expires May 1 @5pm ET. Complimentary high speed wireless internet in the guest rooms. Daily deluxe continental breakfast is included. Breakfast area open at 4am on race day, May 19. Enjoy a great stay at this all-suites hotel with oversized rooms. All the rooms are equipped with a full kitchen and living area. Book HERE or call +1-201-552-5600 and mention “Gran Fondo New York” when making the reservation. $189/room/night for Standard King and Double rooms. 3 miles / 5km from GFNY Finish Village & GFNY Welcome Zone. Safe access by bike via local roads. Comfortable and clean hotel at the heart of registration/start/finish. Book HERE or call +1-201-871-2020 and mention “Gran Fondo New York” when making the reservation. Daily breakfast is included. Packed breakfast bags at 4am on race day. 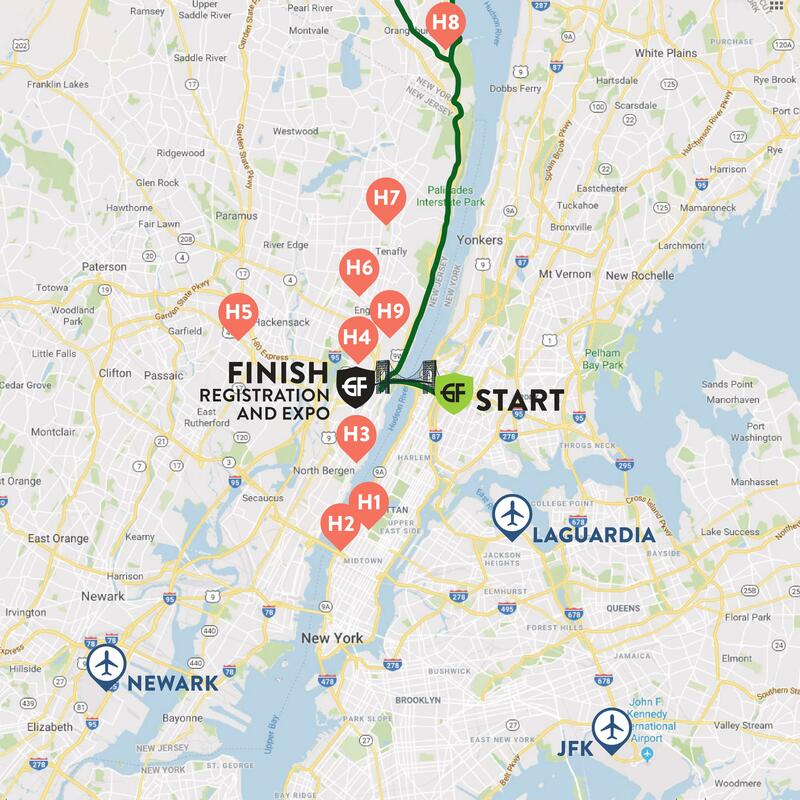 Comfortable and clean hotel, near the GFNY race course for pre-race cycling and close proximity to Fort Lee. Book HERE or call +1-800-275-4411 or +1-201-871-3200 and mention “Gran Fondo New York” when making the reservation. $129/room/night for Standard King and Double rooms. Daily breakfast is included. To Go Breakfast Box at 4am on race day, May 19. This hotel is directly on the race course, ideally located for pre-race cycling & scenic ride and course preview for Registration. 15-minute drive to Fort Lee Municipal parking lot for race day. Book Here or call +1-845-732-6000 and mention “Gran Fondo New York” when making the reservation. Includes American Deluxe Breakfast Buffet, and Grab and Go breakfast bag at 4am on race morning. Book HERE or call +1-877-666-3243 and mention “Gran Fondo New York” when making the reservation.